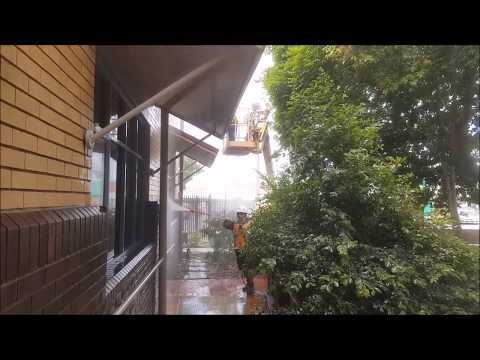 Commercial facilities require external cleaning to look their best. These might be commercial office space with high windows that are covered in dust, or areas covered years of grime and pollution build-up, or paths or other surfaces that are a hazard and require cleaning as part of a duty of care. Removing the dust, dirt and grime will not only make your facility look better, it will slow the deterioration of the buildings and extend the life of paintwork. A good clean may save repainting for several years and allow other maintenance to be done at a lower cost. Our soft wash technicians are experienced with the best approach to clean your facility without damaging paintwork or any other surface. We have years of experience conducting this type of work and have the best method to give you the result you require. We have the latest and best pressure cleaning equipment to clean any hard surfaces such as colorbond sheds of walkways around your facility. From small buildings to large buildings, our team have the training, skills and care to bring your building to their original condition. If you own several commercial facilities located in different locations CleanUpCrew can provide a cost-effective packages for your external cleaning and concrete cleaning needs. © 2019 Cleanupcrew, all rights reserved.